More than just spectacular views. Set on the roof terrace of Singapore’s Esplanade Theatres, Orgo offers more than just spectacular views of the bay. The bar’s cocktail menu is out of this world featuring original creations like vanilla dragonfruit martinis and spicy strawberry margaritas. Come for the views, stay for the drinks. The name Orgo is short for “organic chemistry” and, though the menu reads like the experiments of a mad bartender, the results are always delicious. The delicate flavour of a watermelon martini gets a kick from the addition of chilli, while a sip of the golden pineapple and lemongrass martini will transport you to the beaches of Thailand. There are 10 varieties of fresh fruit margarita each complemented by a flavoured salted rim, such as mango with rosemary salt or passionfruit with coffee. Orgo also offers their own version of the Singapore Sling made from organic ingredients (unlike the more expensive Long Bar at Raffles Hotel, they do not use pre-mix). All guests are given a glass of fresh grapes to nibble on, but if you’re in the mood for something more substantial there is a tapas menu with fusion creations like chicken rice sushi, smoked duck with fruit chutney and crispy pork belly with apple. Tapas are in the S$10-15 range, or you can get a tasting platter of four for S$45. A dinner menu featuring homemade pasta and French-inspired entrees is also available. Prices are a bit high even by Singapore standards, though a lot of work clearly goes into each drink. Their signature fresh fruit martinis and margaritas are priced at S$18 (or S$15 for the non-alcoholic version) and S$20 for their version of the Singapore Sling. A glass of beer or wine starts from S$12 (or S$10 during happy hour from 18:00–20:00 every day), but we highly suggest splurging on one of the memorable cocktails. Orgo’s rooftop setting is magical at night and there are no walls, only glass partitions, to obstruct the view of shimmering Marina Bay. 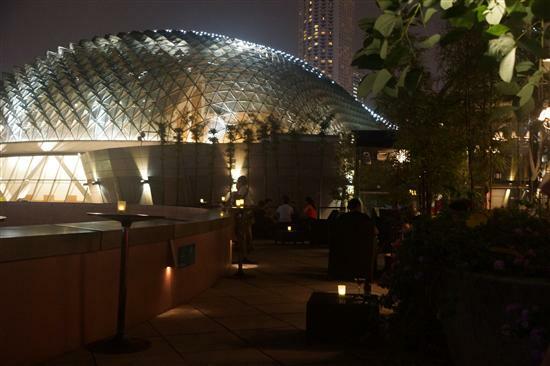 It’s an ideal spot for a pre-theatre drink or as a vantage point to enjoy the free concerts held a few floors below at the Esplanade’s open air stage.